Current operations point to the increasing employment of the small infantry-tank team in a role requiring the closest cooperation and the ultimate in mutual support. Recent reports stress the need for the sound training of each individual in his own and his unit’s share of the job and for better understanding of the cooperating unit’s responsibilities, capabilities, and limitations. Joint training which will develop team unity must supplement technical training if missions are to be efficiently accomplished at minimum cost in lives and time. Acquaintance Aids Teamwork- From the 752d Tank Battalion: “The tank-infantry team must work together from 48 to 72 hours at a minimum before it can hope to operate smoothly. It takes time to learn how the other unit does things and expects you to do them. For more info, you can visit the official website of cyber mentors. The following extracts from field reports describe team plays used by some tank-infantry units in specific situations. -In General From a 36th Infantry Division training memorandum: “When infantry and tanks are used together, the tanks’ primary targets are enemy machine guns and riflemen. Tanks will also make paths through wire and anti-personnel mines and break up any counter-attack . -In Woods From the 774th Tank Battalion: “We gained surprise in using our light tanks with infantry in woods by having the tanks follow the infantry from phase line to phase line. When resistance was met, the tanks would go up quickly (with guides) and spray enemy positions with canister and .30-caliber machine-gun fire. One section of tanks was assigned to each assault rifle company. Mine re-movers moved just behind the infantry and cleared routes for the tanks. The infantrymen checked all clearings for antitank positions. “When possible, the tanks moved off the trails and covered one another. On each tank the bow gunner covered the area to the left, and the coaxial gunner covered the area to the right. -In Heavy Undergrowth – A report from Headquarters XIV Corps includes these comments on target designation: “Jap pillboxes are usually extremely well hidden and tanks are almost blind in thick vegetation or undergrowth. For these reasons, prime consideration should be given to target designation. Tank obstacles as well as targets should be designated to the tank commander by the infantry squad leader whenever possible. 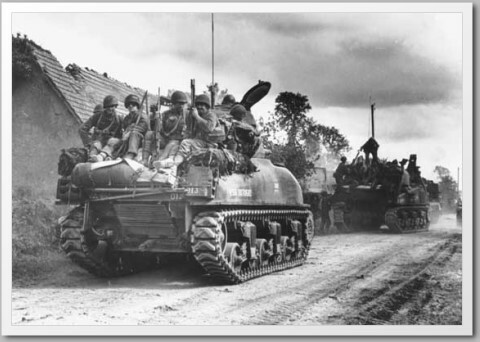 From the 36th Infantry Division: “Platoon and squad leaders frequently forget during attacks that tanks are supporting them. “Infantry leaders frequently go to a tank commander and tell him an enemy machine gun is holding them up but can give no idea of its location. 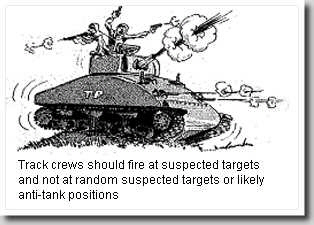 Even giving four or five possible locations helps the tanks to reduce such a target. “Lack of communication between tanks and front-line infantry often makes real coordination impossible. “Time for tank reconnaissance and orders is often not provided. “Failure to use enough tanks sometimes reduces the effectiveness of the combined assault. “Tank timidity is frequently encouraged. Tanks must expect losses as do the riflemen. “Failure to give tanks the complete plan of maneuver reduces the effectiveness of tank support. Says Lieutenant Colonel Kinne, 781st Tank Battalion, after working with six infantry divisions during European campaigns: “In an infantry mission, a maximum of 10 men may be carried. “It is imperative that before mounting the infantry, thorough plans are made by the infantry commanders and tank commanders who are to ride together. It is the duty of the infantry commander to mount infantry personnel in such manner as to preserve unit tactical integrity. This insures that no time is lost in organizing for combat after dismounting. “Heavy-weapons units as well as riflemen may be transported. A complete machine-gun or mortar crew with weapon can be carried on a tank. “On the march, tanks provide their own security by pointing some of their turret weapons in each direction. “The infantry riding these tanks can greatly aid the security of the column by maintaining watch over the same terrain covered by the tank gun. This is very important since the tankers’ visibility is generally poor. “At a halt, the infantry dismounts and takes up security positions. 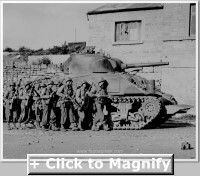 Two infantrymen from each tank patrol at a distance, and the others provide close-in security. “On arrival in the vicinity of the objective, the tanks will halt and take up all-round defense positions. The infantry will dismount and leave a small number of men for tank protection; the remainder proceed with reconnaissance. When contact is made, the. tanks prepare to support the infantry on call. “Mounting and dismounting are on tank commander’s order only; upon coming under fire, tanks will take up prearranged road-march positions and the infantry will dismount and form local security. “All men must hold on to the rope or the tank. They must not hang on to another rider for support. “Men must not smoke on tanks. Fire hazard is very great. “When going through wooded trails or roads, keep eyes to the front to avoid being brushed off by branches. From the XIV Corps in the Pacific: “When the final objective is reached, the tanks should halt and fire with all available weapons at definite targets or places of likely enemy approach or concealment. The infantry squads of the two forward platoons as well as the company support platoon, should immediately push forward to the rear and flanks of the tank line and construct a defensive position. If the attack formation has employed a company of tanks with a company of infantry (i. e., three infantry-tank teams in line or in echeloned line), a reserve reinforced company of infantry must be moved forward to construct the defensive positions. This position should follow standard infantry procedure. of emplacing automatic weapons and mortars, of organizing the ground, digging in, and putting out protective wires. Prepared concertinas may be carried into action on the rear decks of support tanks because time is too short for apron fences to be constructed. No guns should be emplaced nor wire laid in the lanes made by the tanks as they advanced in the attack. “After the defensive position is organized, the tanks and their protecting squads should withdraw via the original routes of advance. In turning to withdraw, all tank should turn to the right about if possible. A standard procedure like this enables the protecting squads to clear the danger space without confusion and subsequent loss of time. Tanks on withdrawing must reverse their turrets and keep them trained in the direction of the enemy because enemy AT guns silenced during the action may he re-manned in time to fire on the withdrawing tanks. “After the tanks have withdrawn, the lanes should be closed by concertina wire, and further preparations made to repel enemy counterattack. Special attention must be given to strengthening the flanks of the salient. Infantry must investigate all ground within the salient and search all positions for enemy personnel. Heaps of enemy dead should be investigated to insure that none are feigning death. Between the Leaders “Because the infantry squad leader furnishes information which directs the fire and movement of his support tank, communication between him and the tank commanders must he continuous and reliable,” states a XIV Corps training memorandum.